SANTA ANA, CA.- Discover the spectacular designs of Carl Fabergé, the master goldsmith and legendary jeweler still celebrated for his inventive designs and meticulous craftsmanship, through a special exhibition, Fabergé: Imperial Jeweler to the Tsars at the Bowers Museum. “There have been many Fabergé exhibitions around the world over the last several decades. However, very few have showcased some of the most rare and spectacular masterpieces he created, which are on display in this special exhibition,” said Peter Keller, Ph. D., president of the Bowers Museum. “The emphasis here is on the objects of luxury that he created—common, everyday objects that he developed with a sense of turning the everyday into the extraordinary. Perhaps best known for Imperial Easter Eggs created for the Russian Royal family, the House of Fabergé also fashioned jewelry and luxurious gifts for many ruling families of Europe, as well as other wealthy patrons. Marvel at exquisite objects produced by the Fabergé workshop at its peak, including personal gifts to the Tsar and Tsarina, an extravagant tiara, the magnificent “Fire Screen” picture frame, and the famed “Nobel Ice Egg,” one of the few “Imperial-styled” eggs in private hands. From elegantly simple to breathtakingly ornate, the jewelry, clocks, picture frames, boxes and eggs in this collection have been thoughtfully selected to exemplify extraordinary materials and workmanship. In recent years, the McFerrin Collection has become one of the world’s most important private collections of Fabergé. While many of the pieces in this collection have been featured individually in other exhibitions and publications over the past 60 years, this event marks the first time that the McFerrin Collection has been presented for public display. HIGHLIGHTS OF THE EXHIBITION INCLUDE: EMPRESS JOSEPHINE TIARA Fabergé created this diamond tiara around 1890. The stunning briolette diamonds were a gift from Tsar Alexander I to the Empress Josephine after her divorce from Napoleon Bonaparte. This piece is one of only a few tiaras ever made by Fabergé. 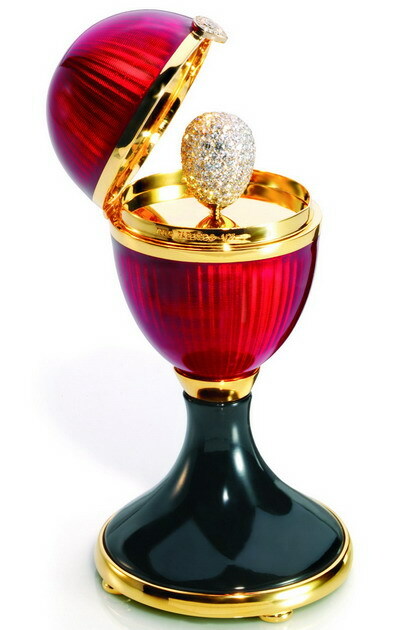 THE NOBEL ICE EGG Tsar Alexander III commissioned the first egg ever created by the House of Fabergé in 1885 as an Easter present for his wife, Tsarina Maria Feodorovna. His son Nicholas II later commissioned such treasures for his wife Alexandra and for his mother, continuing a tradition that would last more than 30 years. Fabergé made eggs for only a small number of other clients; one of those was Swedish industrialist Dr. Emanuel Nobel, who commissioned this treasure between 1913 and 1914. This piece, a jeweled, enameled presentation egg, is also referred to as the “Snowflake Egg,” its shell ingeniously enameled and engraved to simulate the tracery of frost against a misted ground. It opens to reveal a “surprise”—a rock crystal and diamond pendant watch. The unique watch design was created specifically for Dr. Nobel and interpreted in other jewelry pieces by Fabergé, some of which Dr. Nobel gave as favors at his dinner parties. Several examples of these “ice jewels” are included in the exhibition. FIRE SCREEN PICTURE FRAME This intricately decorated picture frame (made between 1908-1917) of gold, platinum and enamel is meant to be viewed from both sides and is arguably one of the finest examples of gold work ever produced by Fabergé. One side features a photograph of Tsar Nicholas II, and the other his wife, Empress Alexandra Feodorovna. This was probably a gift from the Tsar to his mother, the Dowager Empress Maria Feodorovna. The form was most likely inspired by a fire screen, created by George Jacob that was in her apartment. NICHOLAS II PRESENTATION BOX The Imperial Russian court was renowned for the lavish gifts presented to foreign dignitaries visiting Russia. Fabergé made hundreds of presentation boxes, but many connoisseurs consider this his finest. Made of gold and decorated with enamel and diamonds, the box features the cipher of Tsar Nicholas II on the cover. The Emperor presented the box to Leon Bourgeois, a French politician and statesman in 1902. Bourgeois was one of 90 foreigners to receive a snuffbox with the Emperor’s initials. THE WEDDING CLOCK Tsar Nicholas II and the Empress Alexandra Feodorovna jointly purchased this enameled clock in 1896 just weeks after they were married. One of the first furnishings they selected for their marital home, the clock has a blue enamel finish signifying true love. From an apprenticeship in goldsmithing to becoming “Goldsmith to the Imperial Crown,” Carl Fabergé led an extraordinary life creating unparalleled wonders. Learn more about the events that shaped this legendary jeweler’s life – and visit the special exhibition to see his remarkable accomplishments.